Atlanta homeowners can save up to $2000 on replacement windows through the city's SHINE energy efficiency rebate program. An average Atlanta home has an estimated yearly energy bill of $2,295. A properly weatherized home (which may include energy efficient replacement windows) can decrease that annual bill by $1,000! 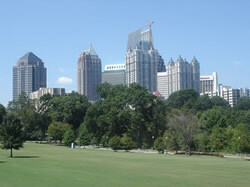 Atlanta's program is called SHINE (Sustainable Home Initiative in the New Economy) and it began in August 2010. You can receive a rebate of 25% of the cost of installing replacement windows, for a maximum rebate of $2,000. To get the rebate, you must first get a home evaluation from a Georgia Power Home Energy Improvement Program contractor. You and the contractor will assess the replacement windows project. Once the project is complete and you have paid the contractor, the contractor submits the rebate to the city for you – they handle the paperwork for you, isn't that great! Even better, the rebate is paid directly to you! The program does not have a scheduled expiration date, but, like others, will end when then money runs out. Income-based assistance is also available to homeowners who qualify. In addition to the generous rebates offered by the City, homeowners may also quality to receive additional rebates of up to $2,200 from the state utility, Georgia Power. And don’t forget the additional $500 federal tax credit for 2011 for replacement windows. All of these rebates combined could mean thousands of dollars in savings for you and your home! If you live in Atlanta, don’t miss this opportunity to make your home more beautiful and energy efficient and take advantage now of these generous rebates for replacement windows. Funding won’t last long, so click here to have a licensed Atlanta window replacement contractor provide you with a free quote.